Pudget: Losing Weight On a Budget! : Ali Vincent Book Giveaway! Click here to check out my friends Giveaway!!! 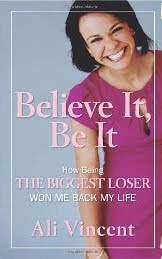 She is giving away an autographed copy of Ali Vincent's book "Believe it, Be it". All you have to to do to enter is become a follower of her blog "Lost it, Found it".